April 5, 2003 - David McManus writing - no. 5 is tent 10 with "you gotta stay loose" [Bill] Brooks. December 31, 2002 -- John Mercer writing -- Yes, I think that is Charlie Burnham to Dave's right. 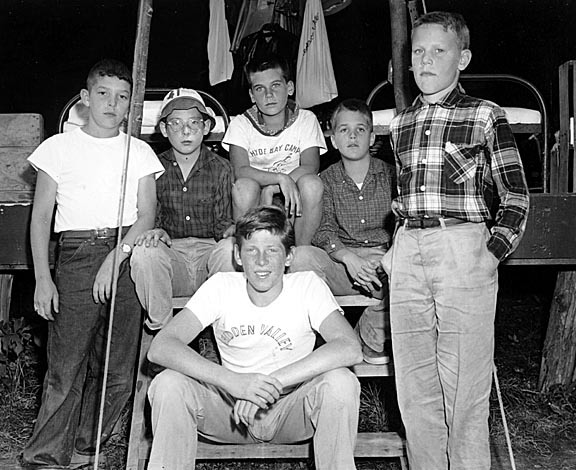 Tent 10 in 1957 had Brooks, McManus, D., Burnham, Fenwick, Allen, Fisher, E., Rogers, W., Saunders, and McAuley. I can't find Walter Rogers here; any others? December 29, 2002 -- Mac Mellor writing -- Dave McManus directly behind councilor that John Mercer identified as Bill Brooks. Charlie Burnham to Dave's right? Tent 10 in 1957? Left to right: _______, Charlie Burnham, Dave McManus, Ed(?) Fisher, Freem Allan.